I loved A Tale Dark & Grimm. That being said I have to also say that I know there are many who may not agree with me. I LOVE fairytales. I especially love the original Grimms’ Fairy Tales and read them over and over as a child. I am delighted with Gidwitz’s version for two reasons: (1) he holds true to the original Grimms’ tales–not shying away from or trying to re-write the more violent punishments and harrowing obstacles in a more palatable way for sensitive readers; and (2) the insertion of a narrator who is able to point out both the thrills and the nonsensical aspects of those very events. It is for these same two reasons that some readers will not enjoy Gidwitz’z series. (It is comprised of 3 books: A Tale Dark & Grimm, Through a Glass Grimmly and The Grimm Conclusion.) If you do not enjoy the structure and form of fairytales, this series is not for you. Gidwitz takes several of the original Grimms’ tales (some well-known, some known only to those of us who read EVERY story in The Complete Grimms’ Fairy Tales), then inserts or alters two of the best known characters (a boy and a girl) and finds a way to weave those same two children throughout every one of the stories he has included, joining them into a single narrative adventure rather than separate stories. In this case, it’s Hansel and Gretel. 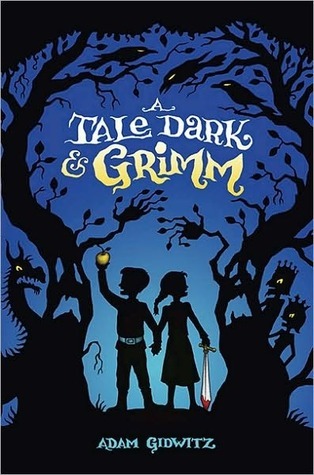 My children (ages 9 & 11) and I listened to A Tale Dark & Grimm as an audiobook in the car. We couldn’t stop laughing at the narrator’s contributions and we all loved the plots of the fairytales themselves. For me it was a new twist to stories I already love and for my children it was a delightful introduction to the form, structure and tenor of fairytales on a higher level than when they were small. We are reading the second book now at bedtime and loving it just as much! This book is funny and light-hearted, very specific about good and evil in its plot and characters (the way ALL good fairytales are) and–be warned–does contain descriptions that some parents (and young readers) will find unacceptable. In Aschenputtel, the original Grimm version of Cinderella, the stepsisters walk down the bridal aisle before their now-happily-ever-after stepsister and have their eyes pecked out by birds as punishment for their cruelty to her. As a child, my mother refused to read that part of the story to my sister and I because she thought it too violent. If you also find this story development unacceptable, this is not the book for you. If you are like me and revel in the best fairytales mixed with a dash of clever humor, grab A Tale Dark & Grimm and dive in!